Home » Dakota woman and Assiniboin girl. The Dakota or Dakhóta (often Santee or Eastern Dakota) are the eastern dialect and tribal group of the Sioux from the Sioux language family, which, owing to their dialect Dakhóta (‘Friends’, ‘allies’) called. Originally the Dakota lived together with the other Sioux tribes in the area west of the Great Lakes, but the Nakota were later ousted by the Anishinabe (Chippewa or Ojibwe) to the south and west. The spokesman of the individual dialects have no difficulty in understanding each other. While Dakhótiyapi (Santee-Sisseton) and Lakȟótiyapi is still spoken by many Sioux, the dialect variant of Dakȟótiyapi (Yankton-Yanktonai) is almost extinct. The Assiniboine Indians are a tribe of North America. They speak a Sioux language that is very closely related to the idiom of Yanktonai-Sioux, from which they seceded before 1640th. 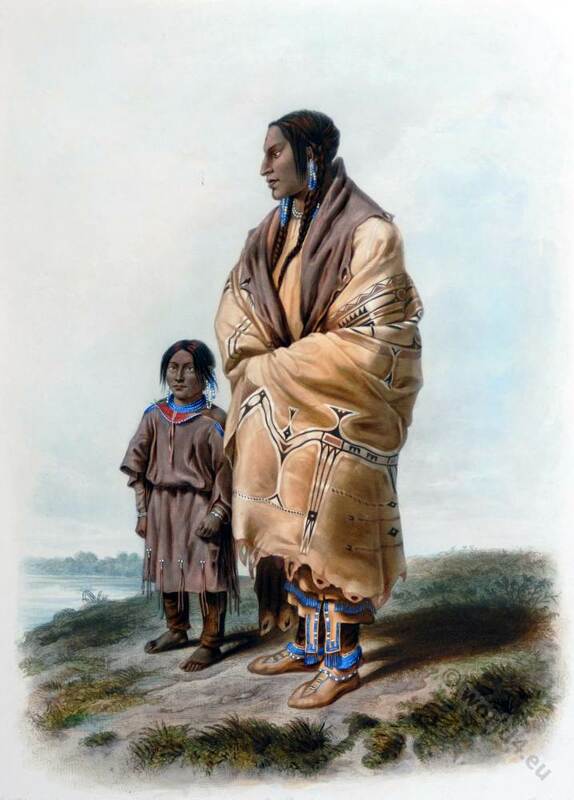 The word Assiniboine is derived both from the Anishinabe word Asiniibwaan and from the Cree word Asini Pwat (or Asini Pwat-sak – plural) ago and means about: “Those Sioux (enemies’), which cook on stones” – the foreign name took it as a nickname and be called Assseeneepoituc.